For 2019, Mazda CX-9 hauls seven in a spacious SUV loaded with technology. If you were going to vote on the international auto company that ranks the highest in design, engineering, and advanced technology, top candidates might be BMW, Mercedes, Audi, Volvo, Honda (via Acura), Toyota (via Lexus), Nissan (via Infiniti), Hyundai…and how about Mazda? In sheer size, Mazda is a small company, based in Hiroshima, Japan, from where it has continually confounded larger manufacturers with engineering breakthrough technology, such as the rotary engine, and SkyActiv engine-transmission-platform design to create performance beyond what is expected. All its vehicles are fun to drive — which the company has captured with the catch-phrase “Zoom-zoom” — with handling excellence that rises upward from the iconic Miata sports car. Being small has allowed Mazda to keep up with larger companies and also branch out in surprising and impressive ways. With beautifully designed sedans and small SUVs making a slick portfolio for 2019, Mazda also has created and refined its largest mainstream family vehicle, the CX-9. Mazda switched over to alpha-numeric designations a few years ago, and now has the compact crossover CX-3, the constant comparison-winning midsize CX-5, and the often overlooked CX-9. 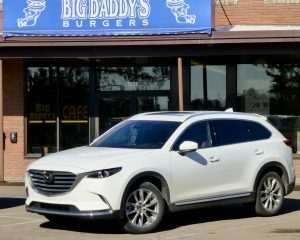 But as the design and technology rose, it seemed to catch up to the roominess of the CX-9, and instead of being overlooked by a lot of comparison shoppers, it now is considered by some the best total package among a field of more acclaimed — and more expensive — competitors. Large grille now stylishly fits in between LED headlights, sets iconic standard. 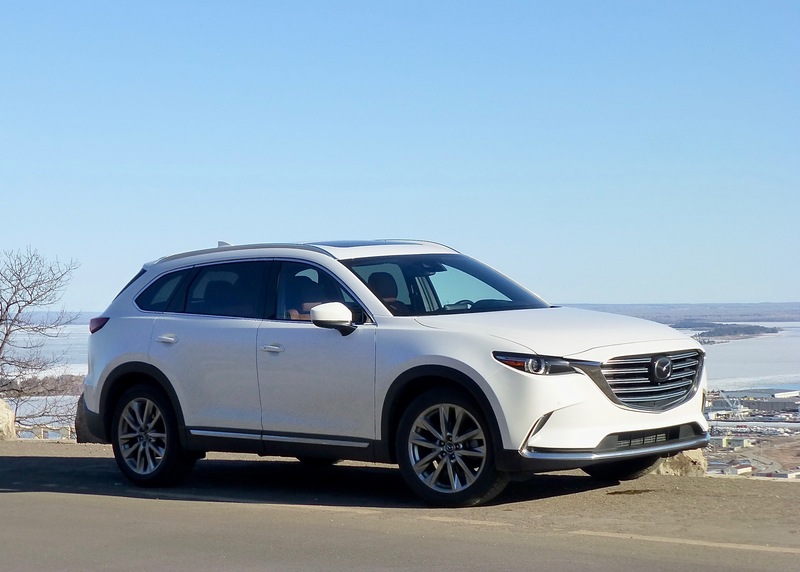 The lines of the CX-9 are indisputably attractive, looking both forceful and classy at the same time, from the large grille opening and on rearward in a continuing harmonious flow. 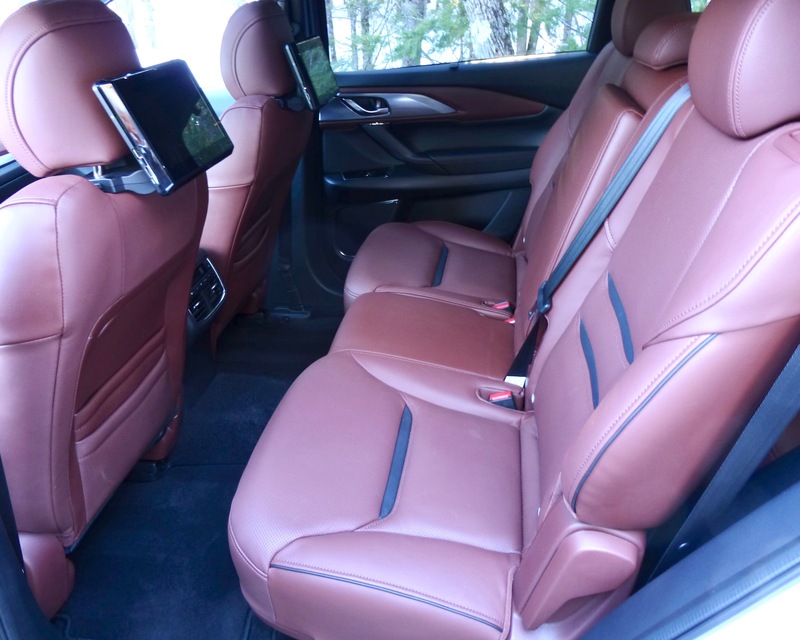 Inside, the CX-9 answers all the questions that might be asked by those who feel they need a three-row SUV to carry their usual load of family and friends and carpools. 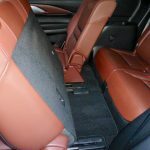 The CX-9’s surprising interior room means there is storage room behind the third row, and folding it down makes a flat surface to carry more stuff than people, when the need arises. With more room comes the requirement of more power, and Mazda solved that issue by finding a new way to boost the amazingly efficient SkyActiv 4-cylinder engines that do such an excellent job of power and fuel economy in Mazda’s cars and smaller SUVs. The answer is turbocharging. 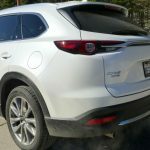 Mazda has the 2.0 and 2.5 engines, and taking the 2.5 and adding the turbocharger transforms the CX-9 to 250 horsepower and 310 foot-pounds of torque. That’s enough to make a front-wheel-drive CX-9 run like a sporty sedan, and it can make the all-wheel-drive version potent enough to bet compared to the larger V6es of competitors. Classy and sporty with ergonomic operation, the CX-9 interior is inviting. Turbocharging the 2.5 also arms Mazda with higher level competitors in other vehicles, such as the Mazda6 sedan, which gets to use the same powertrain. But back to the interior of the CX-9, the test vehicle that came in gleaming Snowflake White Pearl, with a reddish leather interior identified as Auburn that makes an inviting environment for driver and passenger alike. The straightforward instrumentation and attention to detail of the dashboard, console and instrumentation is another attraction. It’s always impressive to start with a plush seating arrangement, front and rear, and the second row has now added video screens on the rear of the front buckets to keep second-row passengers — mainly kids — entertained on trips. 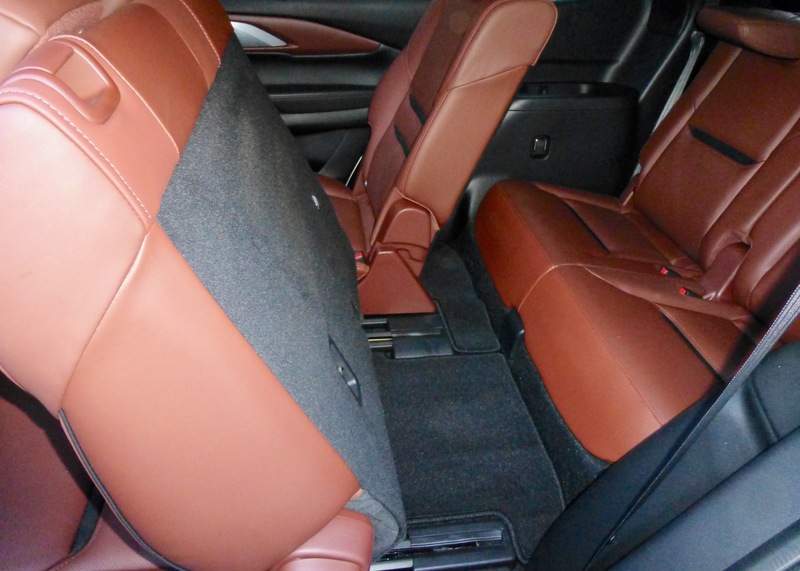 Leather-covered rear seats now have individual video monitors for entertainment. But here is an easily overlooked feature of the CX-9. With virtually any three-row SUVs, it helps if you’re a gymnast if you want to get into that third row. Open the back door, fold the seat down, and then try to fit gingerly into that tight V-shaped opening. Once in, you may or may not find comfort. 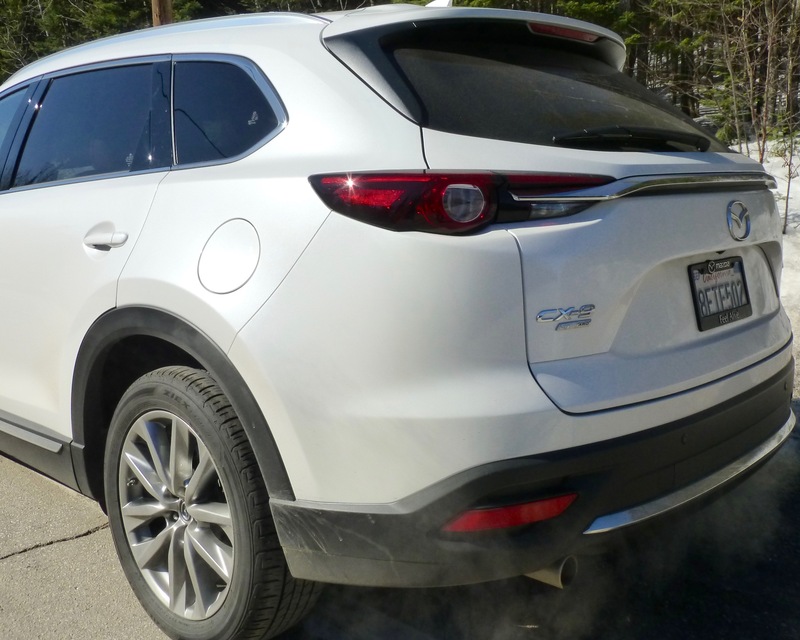 With the CX-9, however, notice the wider-than-expected rear door. Open it, and you have a lot more room to maneuver, and when you fold the seat forward, you can tip it far enough that it is comparatively easy to hop into the third row area. Imagine, seating for six or seven where everybody is comfortable. Wide-opening rear doors allow easier access to second and third row seats. Third row seats are accessible and comfortable. Even loaded with people and luggage, the CX-9 never forgets its Zoom-zoom. Handling is crisp and precise, with tight steering feel and a stability that belies such a large vehicle. Part of that is Mazda engineering, which is responsible for the new and brilliantly devised G-vectoring that has been engineered into all Mazda vehicles. It is a trick to not necessarily fool the driver, but to encourage the driver to make the best and most precise moves in cornering. As a driver makes a tight turn, he is pretty well guessing at the proper “line” to take for both turn-in, and trajectory. After years of zooming, Mazda engineers devised a unique system that seems counter to common sense, but — trust me on this — it works better than you can imagine. You might be fooled into thinking that you are just that good a driver, but Mazda’s G-vectoring makes you a better driver. Logic might make you think you should give more power to the outside wheels, the way Audi did in its first and enduring quatro all-wheel-drive system. But Mazda’s system actually decreases the power to the front outside wheel in a tight turn, while it also softens the damping to that same wheel — only for a millisecond, but at the precise moment you’re starting to turn-in for the corner. The result is to convince you that you chose the right moment to turn in, and while you make the turn at the moment you and the vehicle agree is optimum, you will soon realize that the car corners so well you never seem to need to correct. My often-relayed theory is that many accidents are caused by a driver making a turn with a lack of precision, and having to correct, he or she perhaps over-corrects. With the G-vectoring, you make the turn and don’t correct because you are headed exactly where you want to go. When there’s no correction, there’s no over-correction. While you’re feeling proud of what a great driver you’ve become in the Mazda, you, your vehicle and all your passengers are simply safer. With the house-built 6-speed automatic in Sport mode, you get the full power and torque, and you also get all-wheel steering, which further adds to the precision of going around a curve or corner. 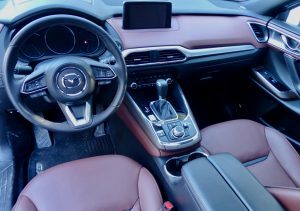 The CX-9 also has the full complement of the latest driver aids, even though we’ve been focusing on things beyond the norm. The heated and ventilated front buckets and full sunroof, rain-sensing wipers, roof rails, power rear liftgate and windshield wiper de-icers are nice. So is that genuine aluminum interior trim, and the second row window sunshades, and tire pressure monitoring system. Stylish rear end houses roomy stowage area under hatchback. 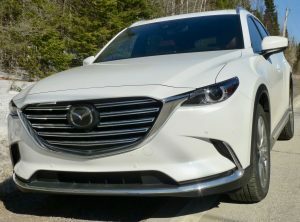 For safe performance, the CX-9 also has dynamic stability control, traction control, front and rear parking sensors, LED headlights and foglights, automatic high beam control, radar cruise control with blind spot monitoring, rear cross traffic alert, 360-degree surround monitoring on the nav screen, lane departure warning, lane keep assist, with smart brake support and smart city brake support. Sporty handling, roomy interior makes CX-9 perfect way to haul seven for burgers. 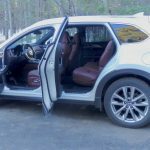 That’s pretty much all the goodies you can order on any top-line luxury SUV, like the Acura RDX, several top Lexus models, or those from the German manufacturers or top U.S. candidates. 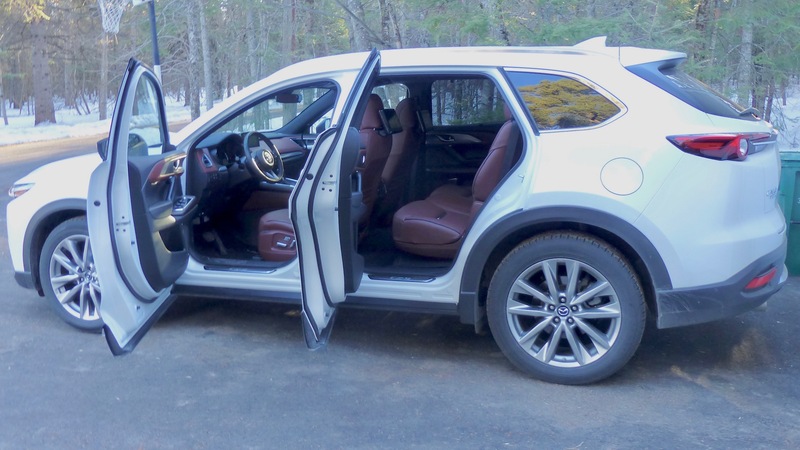 But this Mazda CX-9 adds its unique performance and creature features, and comes in at $45,365. Adding the rear entertainment system and the white pearl mica paint and other options boosts it to $49,230. True, there are other SUVs in that price range, but not with the combination of all those features. The CX-9 also will deliver 26 miles per gallon highway, while holding the road with precision that takes some getting used to. And that is without even considering how it goes around corners so precisely that it convinces you you’re a better driver than you might be in another vehicle.